While one of 2014's tallest residential developments looks to have been brought down to size, another has stepped forward to avail itself as 2015's first 200 metre plus proposal. 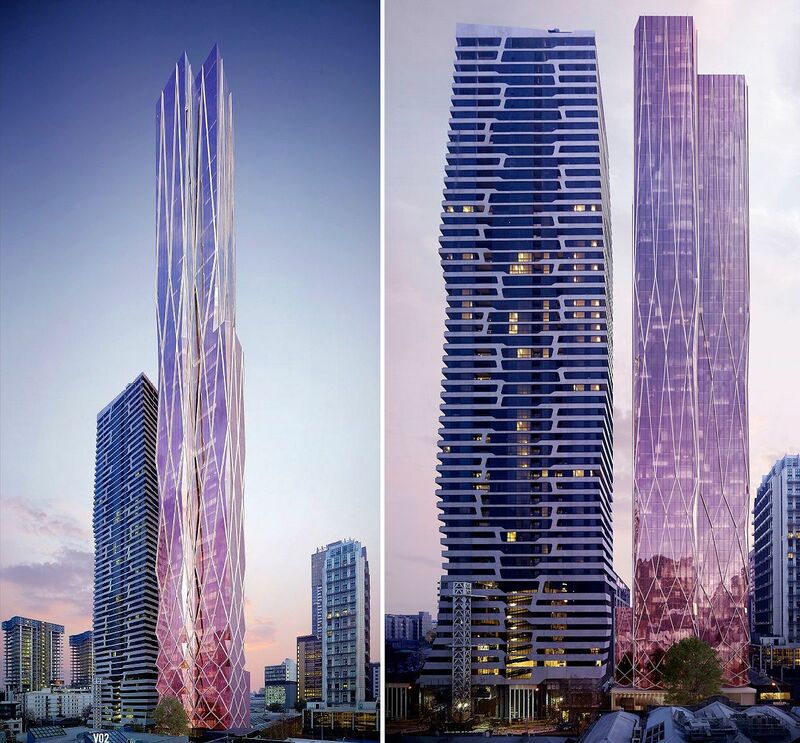 Breaking the apparent inner-city lull in large-scale proposals during recent months, Southbank may well host one of Melbourne's tallest structures with a 280 metre residential tower proposed according to project architect Crone Partners. Conversely images have been published online of a revised residential scheme for 54-64 A'Beckett Street in Melbourne's CBD which show a drastically reduced tower as the likely outcome. Sans 30% of its original height, the proposal still maintains its distinctive pinkish facade as envisaged by architects Elenberg Fraser. 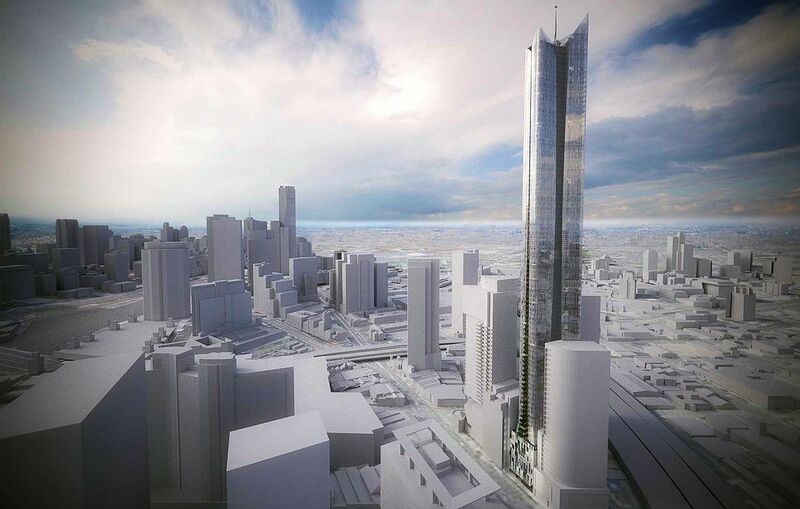 Appearing on architect Crone Partners website in the latter part of 2014, 295 City Road is a residential tower at 261 metres over a 1,161sqm site in Southbank, diagonally opposite the 244 metre Elysium Tower, a planning application for 295 City Road was shown as lodged with the State government two weeks ago. Featuring 532 apartments and retail space fronting City Road, Maretree Pty Ltd has been listed as the applicant with Urbis acting on their behalf. The project has been rigorously designed in accordance with preliminary advice from the Planning Ministers department and is soon to be lodged for approval with the DPTLI. The development is targeting 532 apartments and seeks to maximise amenity for the residents, neighbours and the broader Southbank community. Crone Partners has worked closely with a team of top tier consultants to ensure the design is robust and functional. The design skilfully works within the irregular site to optimise the yield, while ensuring the apartments are carefully planned to avoid overlooking whist maximising the spectacular views. Externally, a delicate seraphic frit is applied to a high performance curtain wall to create a diaphanous skin, which cloaks the apartments to offer protection, shade and glare control. Also lodged during December 2014, a revised 54-64 A'Beckett Street's renders have recently surfaced. Australia 108 developer Aspial - World Class Land is also behind the A'Beckett Street project, with the initial scheme seeking approval for a 253 metre residential tower yielding 300 one bedroom and 450 two bedroom apartments. The key issues of concern are the excessive scale, height and built form of the proposed building, inadequate internal amenity and failure to appropriately respond to development of adjoining sites. A lack of setbacks to site boundaries and limited tower separation to adjacent developments will result in an exceptionally poor outcome for current and future residents. Both projects are in the long queue of planning applications awaiting a decision from Minister Richard Wynne's office. Funny that 54-64 A'Beckett is on the block featured in the hyper-density report. It's still too close to MY80 imo. The building would look far better somewhere else then wedged next to MY80 and across from Empire. If 334 City Rd got knocked back by CoM for 'Out of Proportion' height I don't see that this has much hope either .. Yes generally its not the exact height that matters most (unless you want your skyline to be even for some aesthetic reason) - its the amenity of the street (avoiding continuous shadowing, wind, activated frontages, and avoiding canyons effects with setbacks), and amenity of apartments in both existing, the proposed, and possible future developments. So City Road should be fine, though close to towers either side, neither has apts facing the site, and it mainly overshadows the freeway and narrow streets that are unlikely to be pedestrian priority. And the height of the A'Beckett tower is (was) fine, but still has only minimal separation from MY80, which has apts facing it across that narrow lane (4-7m separation), and sets up similar minimal setbacks further back and to the east where future towers might be proposed, and sets up a big block of shadow on A'Beckett, so - narrower please ! which really means a bigger site. I don't hey how this was approved with those setbacks and seperations.